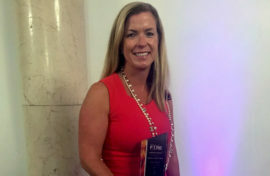 Fish-Will of Weston and Fish-Crane of Hingham are two of 15 in the Greater Boston area named to the prestigious “Woman of FIRE” list; the annual recognition award acknowledges key female players in the local FIRE (Finance, Insurance and Real Estate) sectors. The seventh annual Women of FIRE award celebrates the best and brightest women in their industries. The honorees were celebrated at a July 20th awards luncheon at the Courtyard Marriott Downtown Boston; Massachusetts State Treasurer Deborah R. Goldberg delivered the keynote speech. Both Fish-Will and Fish-Crane’s introduction to the real estate industry came at an early age. Fish-Will spent afternoons at her father’s (Ed Fish) construction company after school, and Fish-Crane was helping at the family business by the time she was 14, stuffing envelopes and performing a variety of odd jobs. Their father started Peabody Properties in 1976, and today, Fish-Will serves as Chief Executive Officer of the company alongside her sister Fish-Crane, who serves as Chief Operating Officer. Fish-Will’s career in the multi-disciplines of real estate spans more than 35 years. She is a designated REALTOR® and member of the Greater Boston Association of REALTORS® (GBAR), participating in the GBAR Broker-Owner Inner Circle Forum. Fish-Will also serves on the Board of Directors and Executive Committee of the Greater Boston Real Estate Board (GBREB), and the GBREB’s Government Affairs Committee. She is also a member and past president of the Board of Directors of the Rental Housing Association (RHA), and serves on the Mass. Housing Community Services Advisory Committee as well as the Board for New Lease for Homeless Families. In 2015, Fish-Will was the recipient of the B’nai B’rith Housing Distinguished Achievement Award for remarkable leadership in the real estate industry by providing quality affordable housing. Fish-Crane has dedicated more than 20 years to the management of client-owned multi-family residential and mixed-use real estate developments. She currently serves as Chair of the Board of Directors of the National Affordable Housing Management Association (NAHMA) Educational Foundation, which brings opportunities for advanced education to residents of member communities and has been instrumental in changing the lives of many individuals and families. She is also a member of the Institute of Real Estate Management (IREM), holding the advanced designation of Certified Property Manager (CPM). Fish-Crane also serves on the Mass. Housing Multi-Family Advisory Committee and is a National Affordable Housing Professional (NAHP-e), achieving the level of C11P through Spectrum. In 2015, Fish-Crane was the recipient of the New England Affordable Housing Management Association (NEAHMA) Industry Award as National Affordable Housing Executive Professional of the Year. “It’s an honor to be distinguished by Banker & Tradesman as a Woman of FIRE, joining this group of remarkable women and being recognized, appreciated, and supported for our commitment to our chosen profession,” said Fish-Will.